You go to these places and it’s hard to imagine there was once so much life there, places where harness racing once thrived. Now they’re Home Depots, Burger Kings, Cheesecake Factories and Dollar Stores. Or they’re condo or housing complexes, such familiar sights all over America that they overwhelm you with their boringness. The world changes, sometimes for the better, often for the worse. Brandywine Raceway, Liberty Bell Park and Garden State Park, once three vital tracks in the Northeast, all succumbed to the changing times and changing tastes of America. As was also the case with Roosevelt Raceway, it became more economically practical to dedicate a huge tract of land to put a Walmart than an arena for a struggling sport. So the three tracks withered away and then died. Atlantic City. Brandywine last raced on Labor Day, 1989. 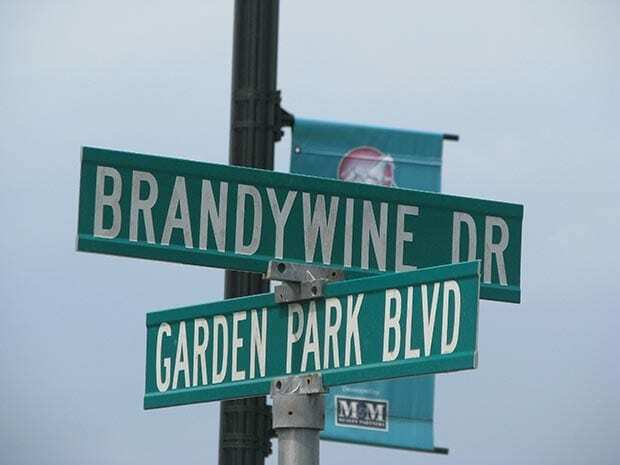 Today, it is a housing complex named Brandywine Hunt, which consists of upscale homes. Many of the streets in the complex (e.g. Sulky Drive, Clubhouse Lane) are named after harness racing terms. The old road sign is all that’s left of Brandywine. Bell opened June 8, 1963. Like Brandywine, it was a top track that attracted many of the best drivers and horses in the East. Thoroughbred racing was not legalized in Pennsylvania until 1968 and the runners competed at Liberty Bell for five years until the current Parx Racing facility was opened up just up I-95. Conflicts with Brandywine and eventually the new Garden State Park were too much for Liberty Bell to handle and the track closed in 1985. Today, a shopping center called Philadelphia Mills sits on the site. About the only reminder of the days when there was a track here is an access road leading into the mall that is named Liberty Bell Boulevard. from Norway. With Atlantic City booming, with racing slumping and with Brennan entangled in all sorts of legal difficulties, Garden State was the wrong track at the wrong time. The last (thoroughbred) card was May 3, 2001. Today, the huge tract of land is a combination shopping mall, the Garden State Market Place, and condo complex. All that remains of the track is a gate house that sits off Route 70.